Kills adult fleas, flea eggs and flea larvae in the environment. Treats, controls and prevents flea infestations. Controls flea allergy dermatitis. For the prevention of heartworm disease (with monthly administration) caused by Dirofilaria Immitis. For the treatment of ear mites (Otodectes Cynotis), adult roundworms (Toxocara Cati), adult intestinal hookworms (Ancylostoma Tubaeforme), and biting lice infestations caused by Felicola Subrostratus. The indications for use are different between dogs and cats. Whilst treatment can begin from 6 weeks of age in both puppies and kittens, the parasites Revolution treats is different between the 2 species. Revolution for Dogs is effective in preventing heartworm infection. It has a safety profile which extends over a large number of breeds and can be used in heartworm positive dogs. Revolution for Dogs also kills adult fleas and also flea larvae and eggs in contact with the treated animal and prevents affected flea eggs from hatching. Thus it is very effective in managing flea infestations. Revolution for Dogs will also treat and control sarcoptic mange and ear mites in dogs. Revolution for Cats is also used to prevent heartworm infection but cats should be tested by their veterinarian for heartworm prior to beginning treatment. Revolution for Cats will also kill adult fleas, flea larvae and eggs in contact with the treated animal and prevent affected eggs from hatching. Flea control is therefore managed well with this product. Revolution for Cats will also treat and control ear mites, roundworms and hookworms in cats. Revolution is a safe and simple way to protect your pet from a range of common parasites. It prevents heartworm disease while treating and controlling fleas (including flea eggs and larvae) and ear mites in both cats and dogs, hookworms and roundworms in cats and sarcoptes mites in dogs. This effective medication is applied to the skin of your pet once a month. Directions for use: Depress the cap to puncture the seal, then remove the cap. Part the hair on the back of the animal in front of the shoulder blades until the skin is visible. Place the tip of the tube on the skin and squeeze the tube to empty its entire contents directly on to the skin. Revolution Flea Control is a once-a-month topical application for dogs and cats. Application is quick and easy and the product should only be applied to a dry animal. The product is water-proof after 2 hours so normal bathing, swimming etc. can continue. The correct tube size should be selected for each individual animal and individual tubes should not be shared between several animals. The cap on the tube should be pushed downwards onto the tube until a "click" is heard and then the cap should be removed. The hair at the base of the neck should be parted to skin level and the entire contents of the tube squeezed onto this area. Do not rub in the liquid. Revolution Flea Control comes in several sizes according to the size of the dog or cat which it treats. The appropriate size tube should be used for each animal being treated. The concentration of active ingredient in the Revolution for Dog and Revolution for Cat products are different so the correct package should be used for the correct breed as noted on the package label. For dogs larger than 40kg - use the appropriate combination of sizes. Most animals will tolerate the application of a spot-on topical treatment quite well. However if your pet is unco-operative, having another person assist can be of immense benefit. Having someone restrain the cat or dog will help. Another suggestion would be to offer the pet a dog treat or cat treat whilst applying the product. For dogs which tend to roll around after application of the product, taking the dog for a walk immediately after application can avoid this problem. All animals need to be completely dry before applying Revolution Flea Control and Heartworm Preventative. Many owners will find picking a date in the month which is significant for them to help them remember the treatment date. For example ensuring the dose is given on the 1st of every month can make remembering the due date easier. Owners could also place a note or sticker on the calendar on the due date to help remember. 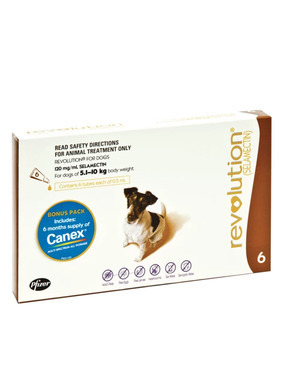 Revolution for Dogs and Revolution for Cats contains the active ingredient Selamectin. The concentration of Selamectin differs between the Revolution for Dog and Revolution for Cat products. Revolution Flea Control and Heartworm Preventative should not be administered to puppies or kittens less than 6 weeks of age. Revolution Flea Control should only be used as directed by the manufacturer. If poisoning occurs, contact the Poisons Information Centre. This product is flammable and should be stored away from heat, naked flame or other ignition sources. Have tried quite a few flea medications on my dogs. This one works the best. It is easy to apply, no smell, no staining. My dogs are outside half the day, and I never see a flea on them at all. i use stronghold, revolution or advocate depending on which i can get the best deal on. I have 4 cats and 4 dogs...these are the best products i have ever used... no issues for the animals and oh so easy to administer! A few years back our cat started acted strangely. She didn't seem steady on her feet and was sluggish. When we took her to the vet he told us she was having an allergic reaction to FLEAS! I had been using Frontline for some time (can't remember for sure but think it had been several years). He said he had switched to selling Revolution in his office and went on to explain why. Pretty much repeated whats written here in the description. I purchased only one application because it was VERY, VERY expensive in his office. As soon as I came home I placed an order here which always saves us quite a bit of money. Our cat has been fine ever since. We've been using petshed.com for purchasing Revolution since we had an AWFUL infestation from a new cat we took in a few years ago. Along with using DE in the house at that time, Revolution was quick to kill fleas. I don't doubt the quality of this product, although my vet advised us against buying online in general. If it works, it works! Store-bought brands have made one of my cats throw up but she does not react badly to this stuff. I really enjoy the fact that this product not only covers the outside threatening insects, it also help prevent heart worms. It took care of mange & fly-bites on the ears on my German Shepherd. It keeps fleas and ticks away which is good since my Great Pyrenees-Golden Retriever likes to sleep on my bed. My Akita-Chow mix sometimes likes to sneak onto my bed too, Great product--highly recommended. Expect exceptional money saving results using Revolution every month from PetShed!!! Thank you so very much! Hooray for Petshed and Revolution!!!! I discovered Petshed 7 or 8 years ago and it has been such a blessing. While working as a volunteer at a Georgia no-kill shelter, I "fostered" numerous kittens and cats. Being new to this I didn't realize it is IMPOSSIBLE to release them once they come into your home. Thus I now have numerous permanent boarders and needed to find a cost efficient method of fighting fleas and heart worms without getting a second mortgage. Enter Petshed. After searching numerous websites, I happened upon this wonderful organization, providing excellent meds at a fraction of the price my vet charges. The meds are current, ship fast and are the same as those purchased previously from my vet. The prices are outstanding and have been a terrific source for my FurKids. Thanks to Petshed, you provide an outstanding service to pet owners! I have referred numerous friends to you and don't know why anyone would purchase pet meds anywhere else. My male sheltie, "Chase", had somehow managed to get both Sarcoptic Mites and Demodectic Mites too. His ears were full of brown crust and he was losing hair on his feet and what I would refer to as his armpits. I was desperate to save him, but mineral oil, shampoos, and other over the counter products were losing the battle against these entrenched little terrorists . . . then I discovered 'Selemectin' and it was safe for Shelties too ! Well, he started to improve almost immediately, and was definitely under control after five or six weeks; After the third monthly application he was not only cured, but his hair was on the rebound as well. I now continue to use it on him as a preventative. My poor kitty Zoe, started scratching great gouges into her skin and licking her fur off her back and tummy. She was constantly grooming herself. I tried a couple of flea preventatives even though neither the vet nor I could find any sign of fleas or flea residue. And they didn't help. Then I tried all kinds of dietary changes right down to raw foods. No change. It was so hard watching her in that state. On a whim when I was in to the vet for a different pet, I decided to try a more expensive flea preparation. The vet recommended Revolution and viola! Immediate cessation of scratching and licking. For nearly a year she has been back to her happy go lucky self and she is now a beautiful, fluffy kitty again too. And thanks to PetShed always carrying it at the best price! Our cat, Sally, enjoys the outdoors but we hate fleas and the health problems associated with them as well as mosquitoes and ear mites. Sally has not had any of these problems while using Revolution. It is absolutely the best! Pet Shed always provides timely shipment and the order arrives about 10 days after ordering ...all the way to the U.S.